The Colts have overcome a great obstacle this past week, and if you don't know what it is, then the corps members have been doing their jobs. The head drum major of the Colts, Kennan Cox, has recently been battling a case of mono, and last week was admitted to a hospital and had to leave the corps. The assistant drum major, age-out Doug Bogatz, quickly took over Cox's position, but his first day on the job was one day before the corps' biggest performance of the season so far, the DCI Eastern Classic in Allentown, Pa. "The position change came as quite a shock," said Bogatz. "I just tried to put my emotions and nervousness aside so I could do what I had to do to get adjusted into this new position as fast as possible." With Bogatz on the main podium, the corps now needed a new backfield conductor fast. Meghan Francomb, a member of the cymbal line and former drum major of the Colt Cadets, was the first person to come to the staff members' minds as a replacement, and was quickly asked to temporarily take over that position. "At first, I couldn't believe they wanted me to do this," said Francomb. "It was kind of tough to make the transition in the beginning, but I eventually realized that it was the right thing to do." Bogatz and Francomb conducted only two full run-throughs before the corps performed under the bright lights of J. Birney Crum Stadium on Saturday, Aug. 2. Greg Orwoll, the director of the Colts, believed the pair pulled off the task flawlessly. "They were very confident and worked very well with the corps," said Orwoll. "Doug didn't miss a beat and wasn't phased at all from being on the main podium in front of the large crowd." Meanwhile, the corps' staff began speaking with another member of the Colts family to permanently take over the backfield drum major spot for the remainder of the season (which was about a week at this time). The position seemed to be a perfect fit for age-out Brianna Seidlitz, a trumpet player with the corps in 2005 and 2006. She joined the Colts earlier this year as well, but had to leave in June due to a serious knee-injury. Seidlitz received the call from the Colts staff on Saturday, Aug. 2 at about 11:30 pm, asking her to fill the position. Without hesitation, she booked a flight at 12:30 am, packed her bags then left her home in Wisconsin at 4 a.m. for the airport. Seidlitz didn't have the money to pay for the flight on such short notice, so a member of the corps' brass staff generously paid for her airfare. "I knew that whatever the cost, I was going to take care of it," said Chad Huel, the Colt's brass caption head. "It was very important for her to be with the corps, especially because this is her age-out year and because she has a family here; this is where she started." Seidlitz arrived in Buffalo, N.Y. Sunday night and began preparing for her new job on the back sideline. She only had two full days to prepare before conducting at her first performance of the season, the DCI World Championships Quarterfinals on August 7. "I've been going to bed listening to the show, waking up listening to the show, and I've been listening to the show during breakfast, lunch and dinner. 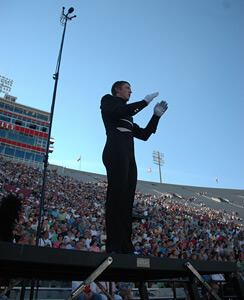 I've never been a drum major in my life, but this has been a great experience so far," said Seidlitz. "It's such an honor to be back for these final days. It's like a dream come true, especially because I'm aging out this year." 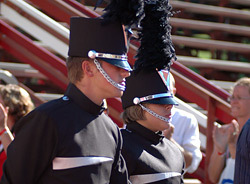 With Bogatz on the front podium, Seidlitz on the back sideline and Francomb back in the cymbal line, the corps was back in working condition for their final performances of the season during the 2008 World Championships. Cox is currently recovering from his illness and is feeling much better. He is out of the hospital and actually attending the World Championships to support his corps. Cox plans to return to the Colts next year so he can age-out on the podium and finish what he started this year. "It's unfortunate that this has happened, but our corps is strong and we'll work through this," said Bogatz. "In the end, we'll all be able to learn and grow from this experience, and that's what drum corps is all about."